Shoppers Drug Mart Canada has a good offer available now. Your PC Optimum app will have a loadable 20x the points offer for Shoppers Drug Mart this weekend. Saturday, March 16, 2019, and Sunday, March 17, 2019, get 20x the PC Optimum points when you use the offer in your app, spending the minimum required. The amount may vary by account holder, as it does not specify in the flyer if it’s when you spend $50, $75 etc. 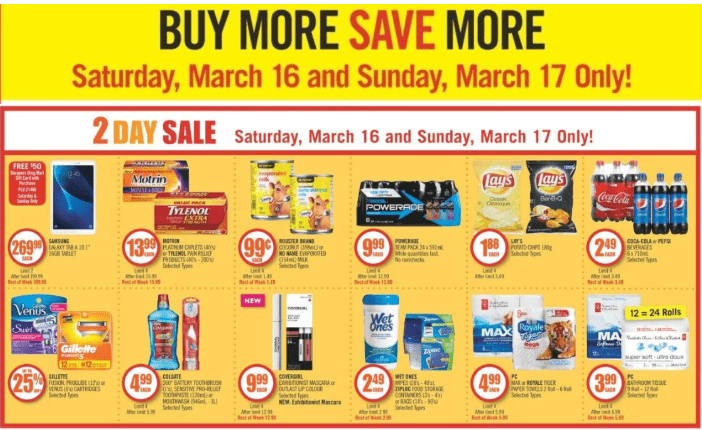 Shoppers Drug Mart’s flyer has Buy More Save More and 2 Day sale, valid until March 17, 2019. there are offers valid all week long. All week long, there is also an offer on Ultimate Dining gift cards. Spend $200 or more on this particular gift card, and you will receive 30,000 PC Optimum point. The points for this offer will be awarded by April the 12th, so hang on to your receipts just in case you need to do a points inquiry if they do not show up in your account by then. Do you realize that our seniors and single moms, students cannot take advantage of the savings with your buy more save more sales because they are on a very limited budget and often space, but you penalize them because they have to pay more for 1 item!!! How sad! So is this helping the community? I think everyone knows that Shoppers Drugmart has inflated prices basically on everything. Their marketing is designed to get you to spend more but you can still gain points if you plan your shopping wisely and use coupons for additional savings. That being said doesn’t mean you will always be successful. If you want to save actual money other than gain points then shop elsewhere at places that allow price matching that’s what I do and it’s not that difficult.